Through the props and costumes of Star Wars, we find a tangible link to connect with the characters from a galaxy far, far away and the stories they inhabit. Inside the Lucasfilm Archive, take a closer look at these artifacts and the stories behind their design. 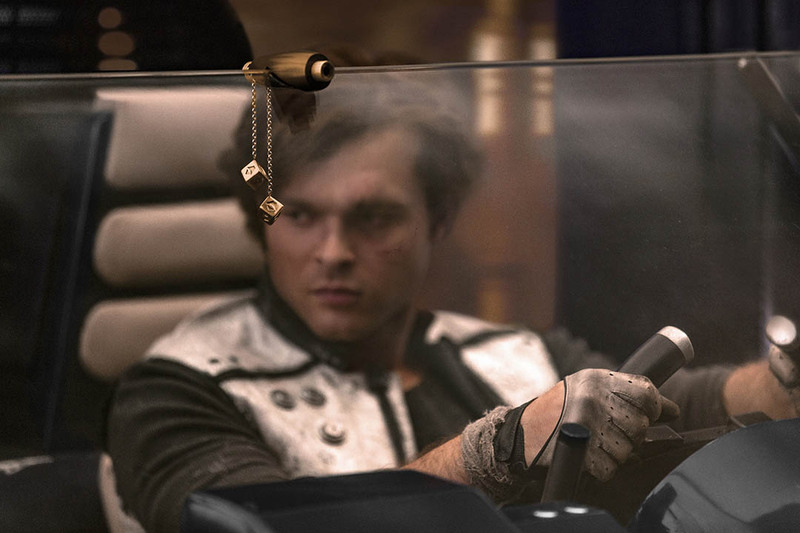 Even after Han Solo’s luck had run out, his golden dice still dangled in the cockpit of his beloved Millennium Falcon, a symbol of a simpler time, when he was a young man on Corellia just dreaming of getting out of the slums and escaping to the stars. 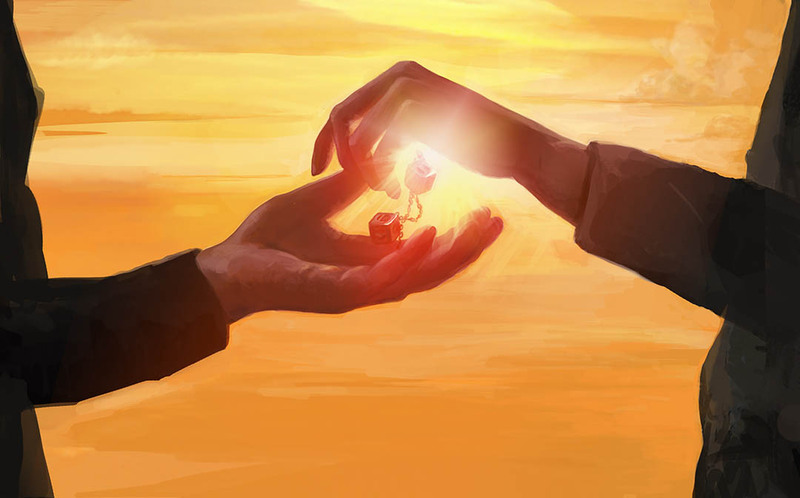 In-universe, the aurodium-plated chance cubes were Han’s lucky charm, whether adorning the windscreen of a stolen landspeeder, tucked into the palm of his beloved friend Qi’ra, or clutched in the hands of his son, Ben Solo. For many years, the dice hung in the cockpit of the freighter he called home, a relic from the Corellian Spike variation of sabacc. The evolution of Han’s dice (from left to right): the original dice prop created for The Force Awakens, concept art by Laura Grant from The Last Jedi, and the prop created for Solo: A Star Wars Story. In reality, the prop counterpart to this particular piece of Star Wars lore has developed over time from simple set dressing trinket to major plot point, with several iterations along the way. “What makes the dice interesting is their evolution over time,” says Lucasfilm Archivist Madlyn Burkert. The dice were first spotted in A New Hope, most notably in a brief shot where Chewbacca’s head knocks them slightly, Burkert says. Many props and costumes from those earliest days of filming have been lost to time, but the first prop was a simple pair of Earth dice painted gold. Nearly 40 years later, the creative team working on The Force Awakens resurrected the diminutive dice when they resurfaced for Han’s reunion with the fastest hunk of junk in the galaxy. The prop used for the part appear to be a light plastic resin casting of Earth dice once again given golden deco by hand. “These are really, really light,” Burkert notes. 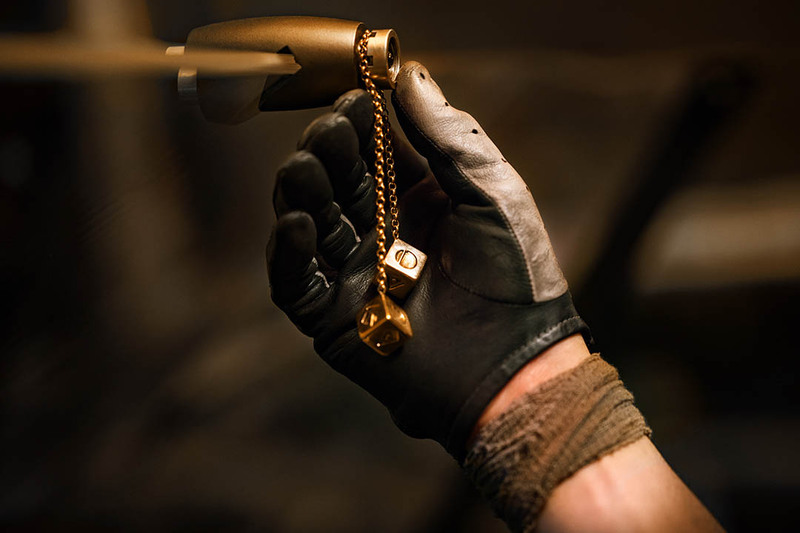 For The Last Jedi, the dice prop became more of a focal point, a symbol of loss passed from Luke Skywalker to his sister, and Han’s widow, Leia Organa. This time, prop makers experimented with fabricated metal, two bronze-colored versions that were slightly larger and heavier than earlier incarnations with finer attention to the detailed symbols on each side, and a golden-hued duplicate for background shots. But for Solo: A Star Wars Story, where the prop plays an even bigger role in exploring Han Solo’s psyche and the events that shaped him, designers returned to the drawing board for yet another, smaller version. “It’s at the discretion of the props making team who is fabricating it,” Burkert says. And each design choice takes into account the prop’s role in the story and how it will be used onscreen. Even with lucky dice, it helps to have a stunt double or two. For more props from The Force Awakens, check out this week’s episode of The Star Wars Show below. Associate Editor Kristin Baver is a writer and all-around sci-fi nerd who always has just one more question in an inexhaustible list of curiosities. Sometimes she blurts out “It’s a trap!” even when it’s not. Do you know a fan who’s most impressive? Hop on Twitter and tell @KristinBaver all about them. How did a space cowboy — with a walking carpet of a best friend — become one of the world’s most beloved heroes? That’s what Gina McIntyre explores in her new book Star Wars Icons: Han Solo, a beautiful tribute to our favorite scoundrel. Filled with rare and never-before-seen photographs and images, as well as exclusive new interviews with Harrison Ford, Mark Hamill, J.J. Abrams, and more, McIntyre follows Han’s evolution from the development of the original Star Wars all the way to 2018’s origin tale, Solo: A Star Wars Story. There’s never been a Star Wars book like it; thanks to a team up between publisher Insight Editions and Sideshow Collectibles, Star Wars Icons: Han Solo is available now, exclusively at Sideshowtoy.com. To celebrate its release, McIntyre has shared some of her favorite images from Star Wars Icons: Han Solo with StarWars.com, along with her own personal commentary. 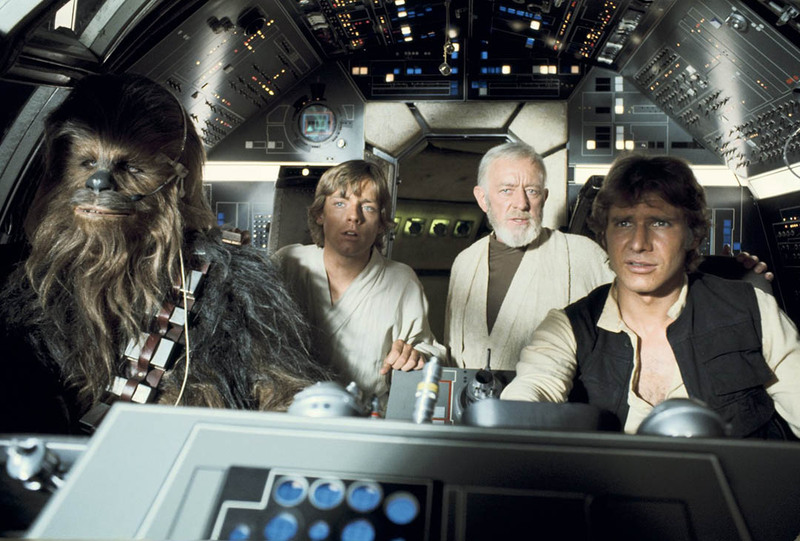 “In Star Wars Icons: Han Solo we really wanted to capture how Han was brought to life on the set of A New Hope through Harrison Ford’s performance, the hectic, ambitious nature of the production, and the camaraderie among the lead actors. This image really captures the energy at Elstree Studios, Harrison’s off-the-charts-charm, and his irresistible chemistry with Carrie Fisher”. Star Wars Icons: Han Solo is available now at Sideshowtoy.com. For more on Star Wars Icons: Han Solo, check out StarWars.com’s interview with Gina McIntyre. See more of Star Wars Icons: Han Solo on The Star Wars Show! Dan Brooks is Lucasfilm’s senior content strategist of online, the editor of StarWars.com, and a writer. He loves Star Wars, ELO, and the New York Rangers, Jets, and Yankees. Follow him on Twitter @dan_brooks where he rants about all these things. 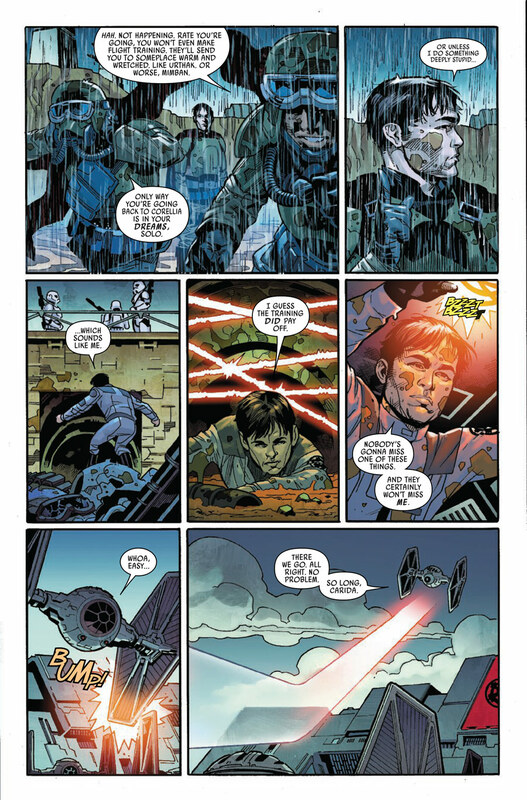 Judging by the scenes that bookend Han Solo: Imperial Cadet #1, everyone’s favorite Corellian might be able to offer up an rationalization for every scrap of trouble he finds himself in — “I can explain” — but more often than not, the person in authority doesn’t buy it. You can see how that might be a bit of a problem for Han Solo. 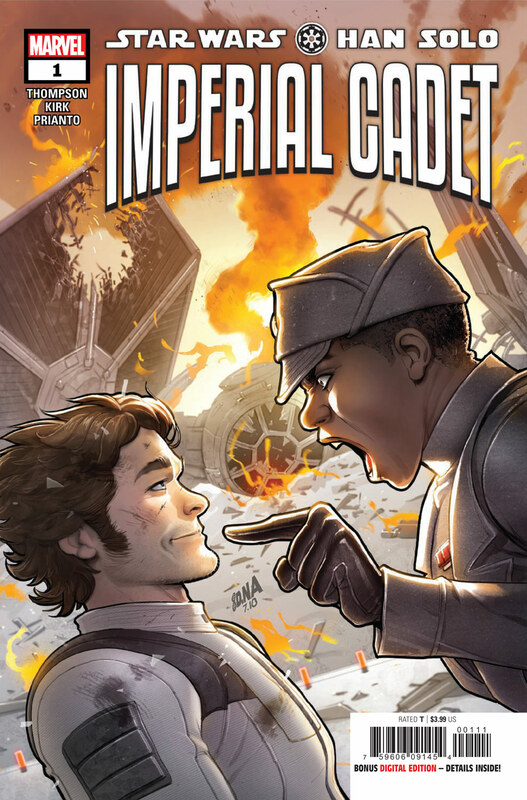 Whereas Solo: A Star Wars Story jumped past Han’s time at the Imperial Academy on Carida and only briefly touched of his time in the Empire, Marvel’s Imperial Cadet miniseries is here to revel in it. There are years of unexplored stories in Han’s past and while Robbie Thompson, the designated Solo Scribe, has said he doesn’t intend to cover every last nook and cranny, we’re certainly well on our way to taking a real fun flight through Han’s life at the Carida Academy, where he doesn’t seem to be any less trouble-prone than he was back on Corellia. While we’re introduced to some intriguing new characters like fellow cadets Hanina Nico, and siblings Lyttan and Tamu Dree, Imperial Cadet #1 centers upon Han. Thompson has written the film’s events on Corellia twice for two different books (Imperial Cadet #1 and Solo #1), but still finds a way to bring new insights into those lost years in Han’s past. Han’s early days in the Empire are far from easy and were likely a bit of a culture shock for the scrumrat, as he’s put through the wringer and back. This makes it all the more impressive that he’s able to hang on to his cocky, devil-may-care attitude throughout. With Qi’ra left behind and his lucky dice with her, he’s left with just two things: his name and his end goal of getting back to her, and he’s not about to let go of either. Repeatedly, he insists on being called Han or Solo instead of his identification number 124-329, even when it gets him a punch in the face. Perhaps it’s not the smartest move, but you can’t doubt his conviction and sense of purpose. He just tends to live in the here and now instead of thinking a few steps ahead. That’s how he ended up in the Carida Academy in the first place. While we’ve seen what Imperial Academies are like before in stories like Lost Stars, Thrawn, and Star Wars Rebels, we haven’t gotten an in-the-trenches view like Imperial Cadet offers us. (The Royal Imperial Academy of Coruscant this most definitely is not.) 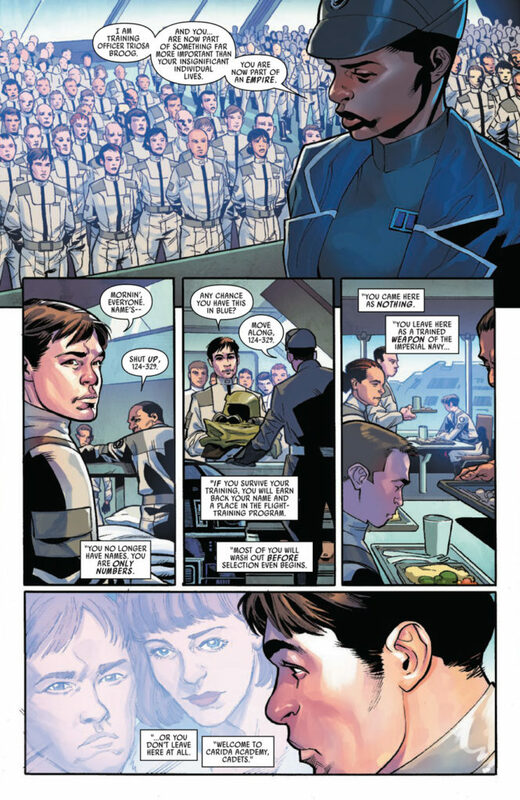 There’s an equally cutthroat vibe between different groups of cadets but Carida appears to be where the rank and file with plenty to prove go, while Coruscant gets the best and the brightest. Seeing Carida on the page shows us the Empire’s version of basic training is no treat for the cadets. Unfortunately for Han, it’s an experience he’ll have to endure if he ever wants to make it into the flight-training program or even have a chance at being treated like a human being again. While boot camp is a standard part of enlisting in a military, the Empire’s version feels more…extreme. The Dree brothers say they joined because they were starving to death on Boiyuh. Han joined as a way to evade the reach of Lady Proxima’s gang (and find a way back to rescue Qi’ra). 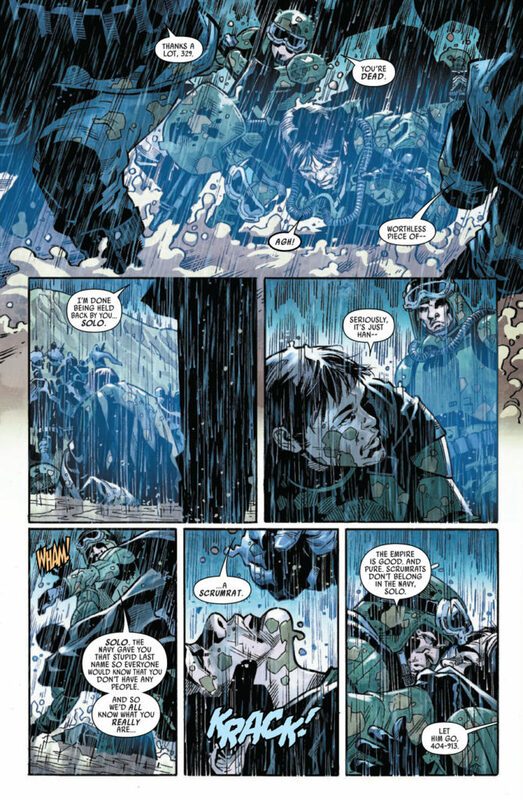 For people like them who likely make up the bulk of the lower, more expendable ranks, the Empire provides an escape from whatever bad situation they were in. It’s not hard to see why the offer to get out would be appealing. After all, the Empire’s Commission for the Preservation of the New Order had an excellent propaganda division that made becoming a stormtrooper or a TIE pilot seem like it was the right thing to do — and even a little glamorous. “Explore new worlds! Learn valuable skills!” the advertisements promised, stretching and coaching the truth in the best way possible. Imperial Cadet #1 proves there are plenty of stories left to tell about Han Solo’s life as it dives into relatively uncharted territory. While we may already know the outcome of his time there, it’s less about the destination and far more about the journey and the friends and enemies he’s bound to make along the way. We’re all just along for the ride. Bria LaVorgna is a writer who doesn’t remember a time when she didn’t love Star Wars. She also really loves Alderaan, Doctor Aphra, and Inferno Squad. You can follow her on Twitter @chaosbria.